Trained in the arts of the arena from boyhood, Iason strikes with lethal grace and precision. Because of his lithe form and sinuous taunts and strikes he is often likened to a dancer on the sands. Iason is a Ludus Magnus gladiator. Sculpture credit belongs to Benoit Cauchies, illustration by Yasmine Putri. Painted byBenjamin Williams. 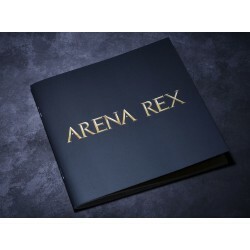 The resin Iason miniature is supplied unassembled alongside a plastic 30mm Arena Rex base, activation token, art card, and game card.